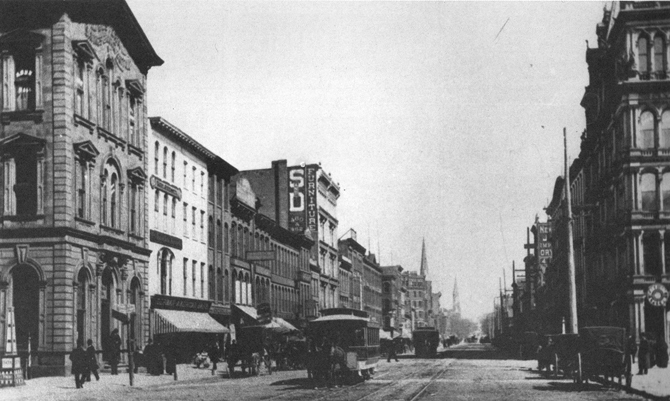 Because they were cautious savers many Germans lost their money in the bank failures of 1857. But the community rebounded. 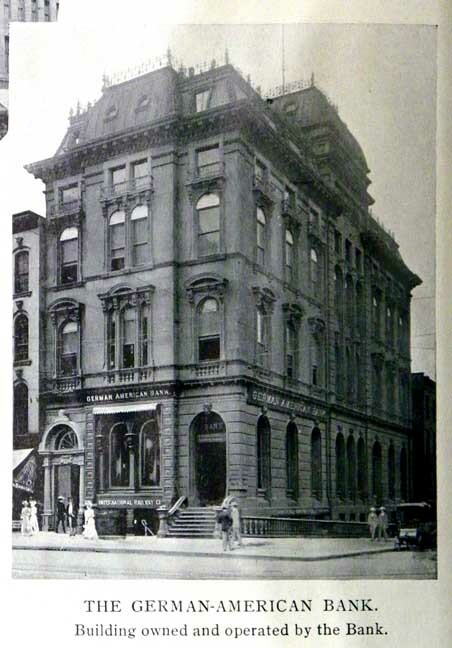 One gauge of the success of the German population was the founding of the German-American Bank in 1882. 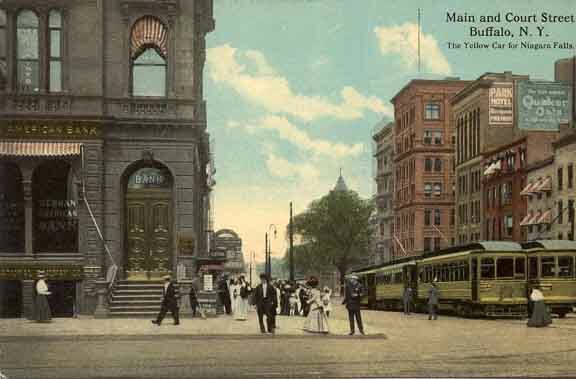 The structure at Main and Court was one of five banks capitalized with German investment. The German-American bank casts light on a later phase of social history - the impact of World War I in hastening the decline of ethnic identification with the old country. 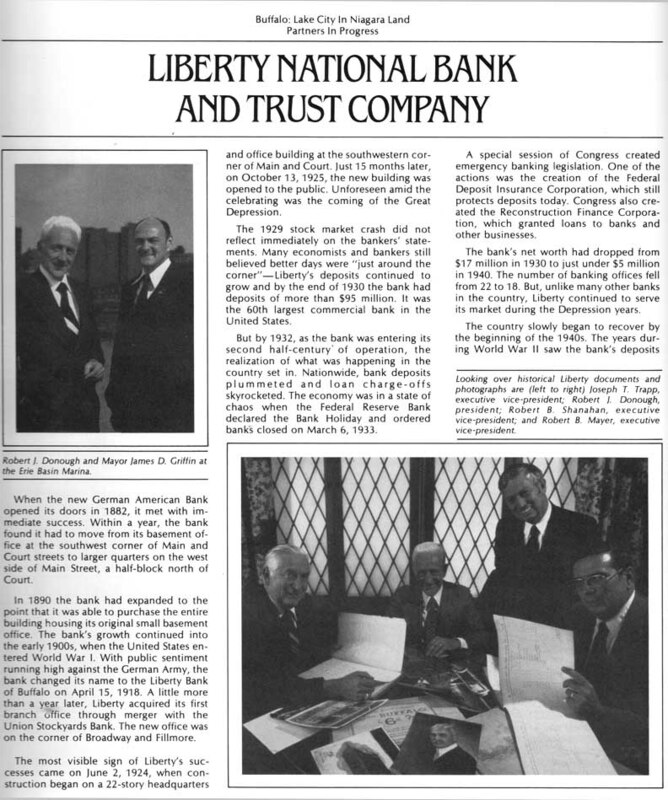 In 1918 amidst the sharp reaction to anything German, hamburger became Salisbury steak, daschunds became "liberty pups," and the German-American Bank took the name we know it by today, Liberty Bank. By Richard C. Brown and Bob Watson. Architect Alfred Bossom (1881-1965) spent the years 1903-1926 in New York City, where he became a designer of skyscrapers. After that period he returned to his native England to a second career as a respected member of the House of Commons. Bossom had great faith in the skyscraper as the building of the modern age, and before he left America he wrote a book on the subject entitled Building to the Skies. Always a man with expansive sensibilities-Lord Bossom was renowned in London for his lavish eve-of-season parties - he generally decked out his tall buildings with romantic paraphernalia. 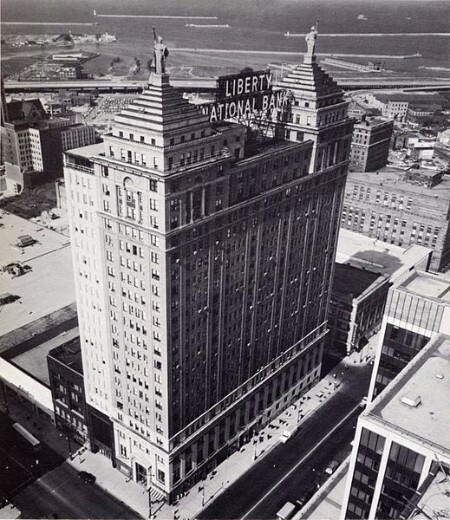 The Liberty Bank is crowned with two reduced in-scale replicas of Bartholdi's Statue of Liberty. High and dry above Main Street, the twin matrons from a distinctive, if slightly fantastic, feature of the Buffalo skyline. 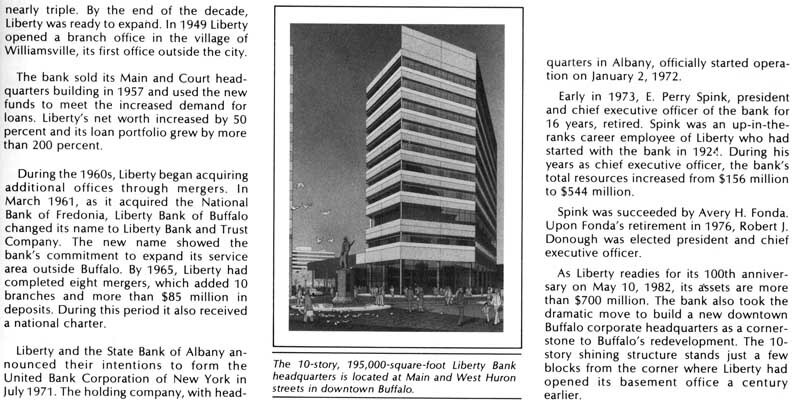 Facing east and west, they are prime symbols in the iconography of Buffalo as a city with a strategic national position. Indeed, Bossom may have remembered that Bartholdi originally envisioned his colossus at the mouth of the Suez Canal, where it was to have marked and international coming together of far-flung civilizations.